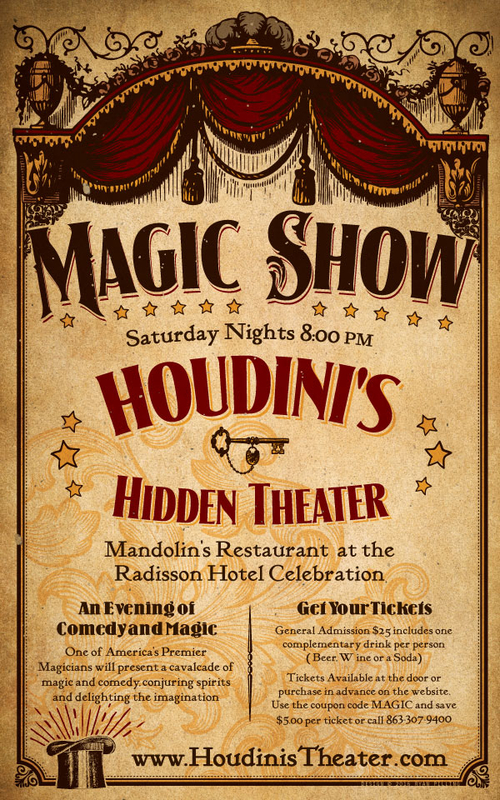 Houdini's Hidden Theater is a Houdini-themed magic show inside a "hidden room" at Mandolin's restaurant at The Radisson Hotel Celebration ​in Orlando, FL. Shows are held at 8:00pm every Saturday. Comedy magician Erick Olson mixes magic with Houdini history during the 60 minute show. Erick tells some whoppers in a video clip at the official website, so let's hope those aren't part of the history lesson. But his wrist breaking gag is great. The Radisson Resort and Mandolin's Restaurant is located at 2900 Parkway Blvd, Kissimmee, FL, 34747. For more information and tickets visit houdinistheater.com.